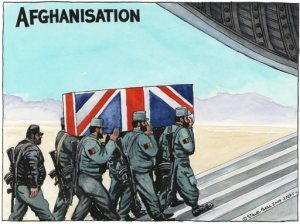 Yesterday five British soldiers were shot dead by an Afghan policeman. Just as they keep promising that they’ve reached ‘decisive turning points’ in their battle with the Afghan resistance, British military officials immediately vowed that the ‘rogue’ policeman would be caught. Today the Taliban reports that the policeman is safe with them, and that he’s been greeted with flowers. Our glorious patriotic press responds. Amusingly, the Daily Mail headline wrings its hands and squawks, “What kind of war IS this?” Because some people aren’t playing by the rules, you see. Instead of sitting quietly in their villages waiting for the drone attack, or perhaps sending their kids out to accept sweets and modernity from a rosy-cheeked English lad, some barbarians are actually shooting back at the invaders. How very unBritish. (To be fair to the Mail – which has never been fair to anyone – it does seem to be taking an anti-war stance today). Other sections of the media worry about the ‘loyalty’ of Afghan troops, as if love for foreign occupiers is a realistic standard of loyalty. Still others, even more clever, psychoanalyse the policeman, wondering if an argument with his commander pushed him to a moment of madness. But it really isn’t that complicated, as anybody who disabuses themselves of imperialist delusion can see. Very simply, people don’t like foreigners striding around their streets and fields with guns and assumptions of superiority. Afghans will kill British troops as surely as Britons would kill Afghan troops if they occupied this country. What Karzai and his friends have succeeded in doing is to expand their stomachs and bank accounts. Afghan opium production is the highest ever. Karzai’s brother Ahmad Wali, like Hamid a name on the CIA payroll, is said to be one of the biggest drug barons of all. This is the progressive, secular government we are fighting to defend. Let’s repeat that so we understand it. Britain is dispensing treasure and blood in central Asia, and enraging the entire Muslim world, so as to stop more brown people arriving at Dover. Now, it is true that when Britain finally leaves Afghanistan it will have to take some of its local collaborators with it. It is also true that nothing plunges a country into long-term breakdown, forcing its people to flee, like imperial intervention and continuous war. Even if we assume, along with all the mainstream political parties in Britain, that immigration is a disaster, the money spent on the Afghan war is enough to build a small island in the North Sea which could be used as a reservation for anti-Taliban Afghans. But the argument is triply fatuous. It’s Pakistan and Iran which house millions of Afghan refugees, not Britain. And Britain didn’t worry about a refugee crisis when it was backing the Taliban before 2001. The Tories attacked Woolas not for the idiotic illogic of his comment but because, according to an obscure and equally illogical argument, his words supposedly insult ‘our boys’. I am heartily sick of the false patriotism that backs ‘our boys’’ right to murder the peasants of Afghanistan. But then, ‘our boys’ is a better formulation than ‘our heroes’. There’s nothing heroic about murder. There’s nothing heroic about signing away your personal responsibility to the state, to following orders when they involve attacking people who have never attacked Britain, who speak languages that you don’t speak and have a culture which you don’t understand. Rather than heroic, it’s monstrous. At very best, it’s plain stupid. At least ‘our boys’ is suggestive of naivete. Many young working class people join the army because it offers them a wage and a career structure – at least until their legs are blown off. For similar reasons many young working class people sell crack cocaine. That’s another profession which carries high risks, but I don’t see the media describing drug dealers as heroes. Back to the raisons de guerre. After each British death Gordon Brown repeats the lie that British troops patrol Afghan streets in order to make British streets safe. The truth is the opposite. Following the terrorist attacks on London in July 2005, Chatham House came to the same conclusion, that imperialist foreign policy is a direct cause of domestic terrorism. This was a view shared by two thirds of the public. Although old-school al-Qa’ida had training camps in Afghanistan, the September 11th attacks were planned in Hamburg, not Helmand, and the necessary training was done in the United States. More recently, a group of potential British terrorists met on an adventure holiday in Wales. So Britain would be better advised to control its terror threat by bombing Welsh wedding parties. But Britain and its allies bomb the Afghans, and encourage the corrupt rulers of Pakistan to bomb the Federally Administered Tribal Areas. Pakistan is an enormous state of enormous importance, and because of the Obama-Brown ‘war on terror’ it now suffers suicide and rocket attacks on a daily basis. Muhammad Idrees Ahmad reports on that here. An old friend of mine confirmed the bad news in a telephone conversation. He told me I wouldn’t recognise Islamabad for the blast walls and checkpoints, none of which have stopped attacks even on army headquarters. Schools have been closed until after Eid. After Eid, he wonders whether he will dare send his children to be educated. A society which dare not send its children outside is no longer a viable society. This war is not sustainable, not for the West and certainly not for Afghanistan and Pakistan. One way of seeing it is as a skewed civil war in which the West backs a coalition of ethnic minorities against Afghanistan’s single biggest group – the Pushtoons. Another way: the West backs and incites an urban elite against a rural majority. The Taliban is no longer a US-Saudi-Pakistan backed Wahhabi fundamentalist force but an evolving coalition of those who hate murderous US-led intervention. When US official Matthew Hoh resigned his post, he described the Afghan resistance in terms not even of nationalism but of “localism” or “valleyism”. We return to the obvious truth: nobody likes armed foreigners swaggering in their streets. Even if by some miracle the Taliban leadership accepted the NATO occupation, ordinary Afghan farmers would not. I refuse to buy a poppy for remembrance day, because Britain hasn’t remembered anything at all. Sentimental rituals such as poppy-wearing only help the collective amnesia. We don’t remember that Britain was defeated in Afghanistan twice in the 19th century, that the mighty Soviet Union was defeated there a couple of decades ago. We don’t remember, or we never learnt, that imperialism is fundamentally wrong. Wrong wrong wrong, in every case. And stupid. We don’t remember that imperialism only ever makes social conditions worse and increases the hatred of the imperialised for the imperialiser. If Britain had learned this simple lesson it would not have stumbled into the US-Israeli war in Iraq or into Afghanistan years before an al-Qa’ida attack here. If Britain knew and remembered that people can only develop their social mores in their own way and at their own pace it wouldn’t accept for a moment the noxious propaganda that we are bombing Afghan women in order to liberate them. If Britain understood that people of darker complexion are just as attached to their land and rights as white people it would never have supported apartheid in Palestine and Zionist assaults on Lebanon. Here is what I will do to support British soldiers. I encourage them to desert, so that they may become true heroes.